The 2014 Lincoln Band performed a few selections from their upcoming halftime show on Thursday at the Shinnston City Park. The band is getting ready to “Light ‘Em Up” this season with their selections, including “My Songs Know What You Did In the Dark” and “Thnks fr th Mmrs” both by Fall Out Boy. Check out the other videos after the break…. So, after chatting with a Suddenlink support specialist it appears that those of us in north central West Virginia who have Suddenlink for TV and Internet will be unable to watch any Olympic coverage online this year. It appears that you must subscribe to both CNBC and MSNBC to be “allowed” to watch content online. Well, unfortunately for us WV folk, CNBC is not available for subscription, thereby knocking all Olympic coverage out the window for us. So much for being able to recommend Suddenlink for TV and Internet. They had a decent track record with me prior to this. But don’t even get me started on Dish network… Much worse. It’s a great day to be a Mountaineer, where ever you may be! Amazing game to watch. Proud of our team! So glad to see them prove so much of the nation wrong by going out and beating up on Clemson. I’ll admit it: I’m not the biggest baseball fan in the nation. But, I do enjoy watching the Pirates play when I get the chance, usually on ROOT Sports. This year I did make it to two games in Pittsburgh, however, and it’s a fun atmosphere at PNC Park. There was a hint of progress in Pittsburgh, at least early on in the season, and it’s difficult to look at an entire season and pinpoint one game that defined it, but I would say the 19-inning loss to Atlanta back in July was the beginning of the end. But it was nice to see the Pirates back on top, even if only for a few days. In this video, some of the Pirates thank the fans for their support. We look forward to seeing more from them in 2012! 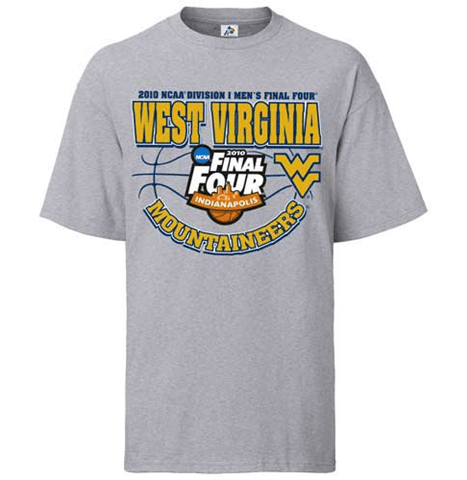 WVU Advances to Final Four! First time in 51 years! And, of course, the shirts are available here. 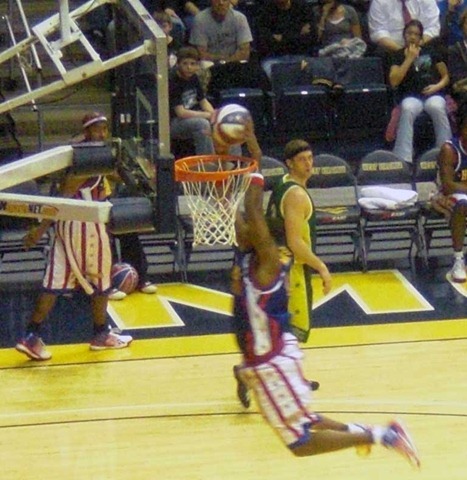 Ryan and I went to see the Harlem Globetrotters strut their stuff at the WVU Coliseum in Morgantown on Monday. I had never seen the Globetrotters in person, but I’ve probably seen them do their routines on TV 50 times. I think what we saw on Monday was probably the same Globetrotter material they’ve performed for the past twenty years (at least). Of course there are some new wrinkles, like Globie’s music. But I think I’ve seen Globetrotter football many times before; it never gets old. It was great to hear Ryan laugh at the fun stuff and even get concerned when “Handles” starts playing for the Generals. I think he saved his biggest laugh for “Big G” smacking the ground repeatedly and generally just flipping around in a goofy fashion. It was just nice to sit and enjoy watching a game where no one was concerned about the final score. The game was more than a game… It was an event.